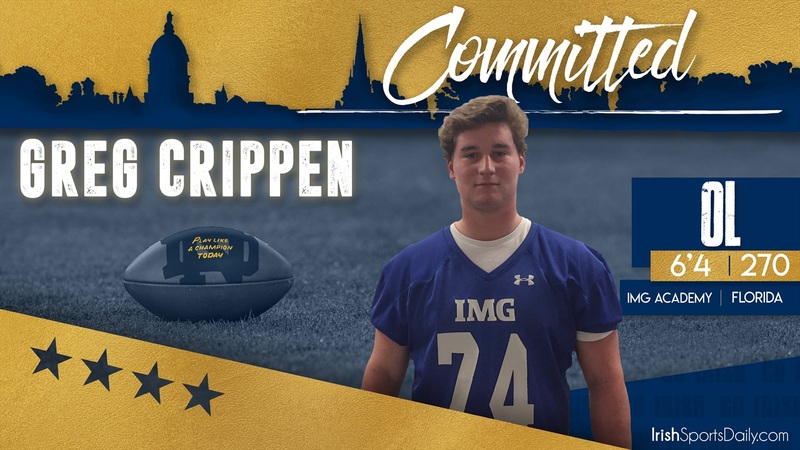 Greg Crippen‍ was happy to put the recruiting process behind him, which is why the 2021 IMG Academy offensive lineman made an early commitment to Notre Dame, just days after taking an unofficial visit to South Bend this past weekend. But that wasn’t the primary reason for the early decision. “I knew,” Crippen said confidently. “I knew it was the place for me. Crippen chose the Irish over offers from schools like Alabama, Michigan, Duke, Boston College and Northwestern among others. “Coach (Jeff) Quinn, Coach (Brian) Kelly, it’s O-Line U and academically and football-wise, it’s just amazing,” Crippen said of why he feels Notre Dame is the place for him. Crippen informed the Notre Dame staff a day after this past weekend’s visit. “They were super excited,” he said. The Massachusetts native said he wants to bring “toughness, grit and hard work” to South Bend. He transferred to IMG from Milton Academy this past year and feels like it’s prepared him for college already. The 6-foot-4, 270-pounder joins California quarterback Tyler Buchner‍ to give the Irish a pair of top targets in the fold for 2021. Crippen hopes to help add some more elite talent.